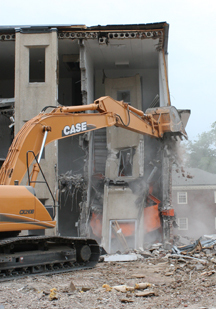 Demolition of the old Sigma Chi fraternity house — a.k.a. Crawford Hall — began in earnest Monday when crews battered the structure and hauled away tons of concrete, bricks, and wood. The structure is being razed to make room for a new fraternity house for Tau Kappa Epsilon. Click here to see photos of Brownsburg’s Mike Worth as he brings down the structure. Gerry Green, site manager for general contractor Brandt Construction, said he believes site prep will be completed by the end of this week and that work on footings for the new building could begin as early as next Monday. The old Delta Chi of Sigma Chi chapter house, renamed Crawford Hall, has been used as living space for independent men since the new Sigma Chi house as built farther west on West Wabash Avenue five years ago. Wabash is in the final few years of its Fraternity Partnership Campaign, through which all nine of Wabash’s college-owned fraternity houses will either be renovated or newly constructed. This summer, phase one work has begun on the renovation of Delta Tau Delta, a project that will be completed over the course of two summers so that undergraduates are not displaced. Meanwhile, members of Tau Kappa Epsilon moved from their home on Grant and Jennison during spring break earlier this year. They’ll occupy the old Phi Gamma Delta chapter house until their $4 million, 40-man house is completed in time for the 2008-2009 academic year. Construction to renovate and transform the old TKE house has been underway since spring break. The new facility will be called College Hall and will be a 70-man independent residence hall ready for occupation this August.